I just installed Gnome System Monitor and I launched KSysGuard side by side, and Gnome System Monitor shows about 200MB of RAM usage higher than KSysGuard, why? Which values are true? 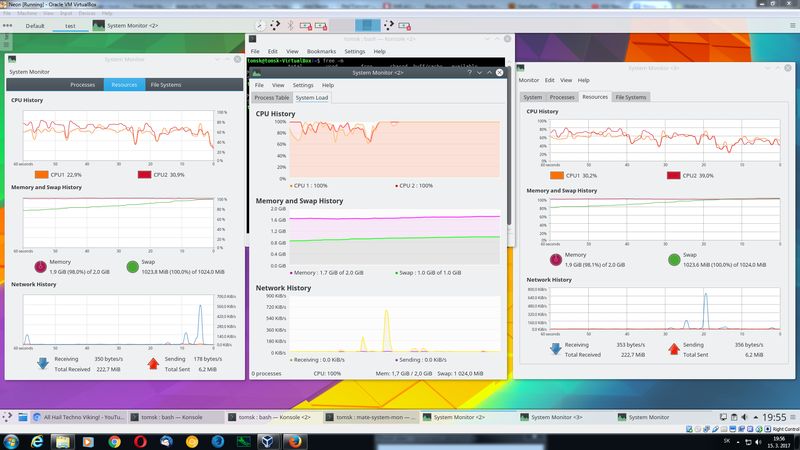 And one more question, is possible to set in KSysGuard smooth refresh like in Gnome System Monitor? I don't know which exact RAM values you are looking at, there is the global RAM usage which is usually irrelevant as Linux attributes as much RAM as possible in a dynamic way, the shared RAM is far more telling. So if you compare something, make sure you only look at the shared RAM values. Other than that, I do not use the Gnome System Monitor, so I can't really tell what is different. KSysGuard is entirely sufficient for my needs. If you look at the values KSysGuard displays you should see that is shows the real time usage (default refresh rate is set to 0.5 s). You can change this setting in the View menu -> Tab properties. FWIW: please always state your Plasma version and distribution so we can actually be more precise in our answers. All system monitors (Gnome and Mate) shows 100% RAM usage (swappiness was set to 0) and you can see that I had really 100% RAM usage because of swapping, but KSysGuard shows that I have some RAM left. The one thing I can see from your setup is that you have way too little SWAP space for the amount of RAM: for systems under 8 Gb RAM you should have at least double the RAM amount for SWAP, in your case you should resize your SWAP space to 4 Gb. As for why the two applications shop different values: I have no idea how Gnome measures, what the exact commands and options it uses, without that knowledge I don't think you should compare. KSysGuard does not show memory used by virtual machines, which is significant, but Gnome System Monitor does. Is there any way to see this memory usage in KSysGuard? I don't like having to install Gnome tools to work in KDE. Does it not show the processes for the virtual machines, or does it show those processes but doesn't report their memory usage? (screenshots appreciated, as well as OS and desktop versions).